If the growth rate is so great, why are the poor not getting a taste of it? Just before Prime Minister Narendra Modi embarked on his five-nation foreign tour, India celebrated a contemporary superlative: the fastest growing large economy in January-March quarter of this year with a gross domestic product (GDP) growth rate of 7.9 per cent. Politically, and also for India’s global image makeover, this is a great news. This news was preceded by the BJP victory in Assam and a forecast of a normal monsoon. And Modi’s much perceived capacity to turn around the country is finally in public display. For him, economic growth, measured only through GDP growth rate, is all about his performance. This is understandable given that in the era of neo-liberalism, GDP is the sacred mantra. The world is increasingly questioning this “dirty” indicator of economy. “GDP is a deeply foolish indicator of how we’re doing economically. It measures the gross volume of monetary transactions in the economy—but it doesn’t care what the money got spent on, and it doesn’t care about the elements of our economic wellbeing that come to us without a price tag,” says US-based economist Eric Zencey, who is championing an alternative to GDP called Genuine Progress Indicator (GPI). There is also a growing demand to tone down our obsession with GDP as a measure of economy. Another significant development happened during this time. And it came from the champion of free economy, the International Monetary Fund (IMF). In a report titled “Neoliberalism: Over-sold?” the IMF conceded that this economic model has failed in triggering economic growth. Rather it has “increased inequality”. This observation is important because it supports the demand for a new measure of growth. Once GDP is junked as an indicator, the real picture will come out. In fact, there have been sporadic debates on the issue. For instance in 2011, the Uttarakhand High Court admitted a public interest petition on adding the state’s environmental value to the usual GDP calculation as the latter was hardly reflected in the forested state’s economy. There is a trend globally to “green” the GDP or to include environmental factors into GDP measurement. This points out the faulty ways of assessing the economy through GDP. Many states in USA, such as Maryland and Vermont, are seriously experimenting with alternative such as the GPI. It is imperative we adopt a new economic indicator. India is an informal and subsistence economy with natural resources like land and forest accounting for 60 per cent of people’s livelihoods. GDP, by design, does not include this in its calculation. It also doesn’t include costs of environmental degradation which impact the livelihoods of India’s poorest. That could be the reason the poor are yet to get a taste of this astounding growth. 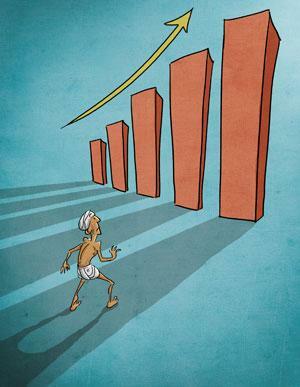 Has Indias economic growth become more pro-poor in the wake of economic reforms? Measuring scale for economic development depends on socio-political philosophy of a society. So it is natural that economic development in the consumer centric society is measured by GDP. All inclusive economical development INDEX should be expression of a society moving away from consumerism. That demands silent social revolution to live in better world.